Yep. 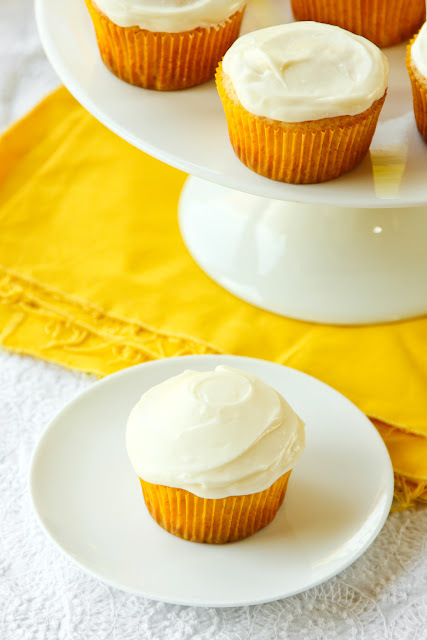 I’m finally saying goodbye to summer with these lovely pineapple cupcakes. You see a couple of weeks ago Stephen asked me to make him cupcakes. Not chocolate or vanilla, but pineapple. I was a little surprised. Pineapple, really? I had never heard of just plain ole pineapple cupcakes. 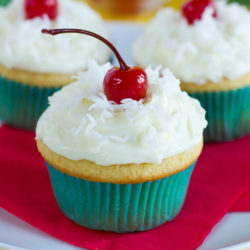 I’ve see piña colada cupcakes, and with those most of their flavor is derived from the coconut. I thought a little about how I could make these cupcakes flavorful. That was when I remembered seeing pineapple cream cheese at the grocery store… of course, that would make an excellent frosting. Then it just came down to getting some flavor into the cupcake. By keeping most of the juice from the crushed pineapple and pureeing all of it, the cupcake would then be sweet and flavorful, eliminating any stringyness you might otherwise get if you didn’t puree the pineapple. So I whipped up the batter, scooped it, tossed the pan in the oven and watched them bake. 10 minutes had passed and I grew nervous. No pineapple smell. Finally after about 18 minutes I could smell it. Hooray! I took them out, let them cool and frosted them. Stephen immediately appeared in the kitchen (he had been studying somewhere in the house) and snatched one up. We both agreed that these were a little taste of summer, perhaps our last. So with that, I’m officially moving onto Fall. Seriously. I have a feeling you’re going to like what I have planned for these next few months, it involves a whole lot of sweet potatoes, pumpkin, peaches, apples and berries! 1. Preheat oven to 350 degrees. Line one standard size muffin tin with liners, set aside. 2. 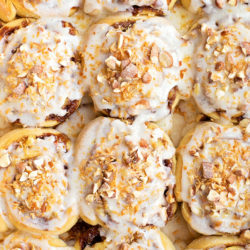 In the bowl of a stand mixer, beat together butter, sour cream and sugars until light and fluffy. Add vanilla and eggs, mix just until incorporated. 3. In a medium size mixing bowl, combine flour, baking powder, baking soda and salt. With mixing speed on low, gradually add dry ingredients, mix until combined. 4. Remove bowl from stand and fold in crushed pineapple. Scoop into liners and fill each ¾ of the way full. Place in oven and bake for 20-22 minutes or until the tops are lightly golden in color. Remove from oven and let cool in pan for 5 minutes before transferring to a wire rack to cool completely. 5. Meanwhile, to prepare the buttercream, in the bowl of a stand mixer, beat together butter, cream cheese, vanilla and salt. With mixing speed on low, add powdered sugar. Add heavy cream and beat for 3-5 minutes until light and fluffy. Frost as desired. Made these – they were a hit with the birthday boy (29)! 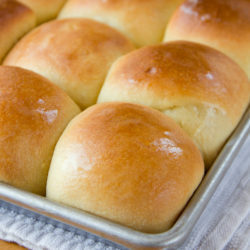 I’d like to mention them on my food blog and will use your link so my readers can go there to see the recipe. Will use my own photos. Two years later, made these for that same b’day boy and his wife (my daughter) for their 12th wedding anniversary. Now my youngest grandson has requested the same recipe ~ in the form of a cake instead of cupcakes ~ for his upcoming 9th birthday. Your recipe for Crushed Pineapple Cupcakes has found a permanent place in our family’s hearts and stomachs!